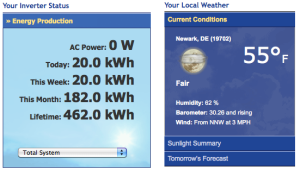 So after 30 days, I am happy to report that the solar PV system has been working flawlessly. We’ve generated about 450 kWh (the web version shows a little more than the electro-mechanical version that’s metering the actual power). This entry was posted in Solar. Bookmark the permalink.